I'll be the first to admit that sometimes finding green options isn't easy. Even though I try living as eco-friendly as possible, it's difficult at times to try new products in my home. It's been an uphill battle more than once, with my husband not wanting to buy what he views as typically inferior products. Let's be honest, until recently there weren't that many green items on the market, and most of these products were not as good at what they were sold for as their non-green competition. I think with my husband it's more of an engineering mindset, you go for what works well and doesn't require more time, energy, and money to use. If I want to change one of our regular products, I usually have one chance to PROVE it works. One of the hardest things for me to find replacements for are cleaners and cleaning supplies. Recently, while searching through Google and looking at a sites going out of business sale, I ran into a new brand – Full Circle. Curious, I went to Google and found their website. Liking what I saw, I reached out to the company, and was truly excited when they let me review some of their products. Knowing my skeptic of a husband, I let him help me choose what product to review. Once we got our box, I was excited to get started! Never heard of Full Circle? The company itself was created by friends with a vision of creating eco-friendly products that weren't only good for the environment, but were meant to last. THey were sick of constantly being dissatisfied with poor quality green products that couldn't stand up to their synthetic counterparts. Rather than going with the linear use and throw away cycle, they wanted all of their products to go back to the Earth quickly, or be able to be recycled. In the end, they created a number of products that were designed to not only work, but withstand the daily abuse of a busy family. 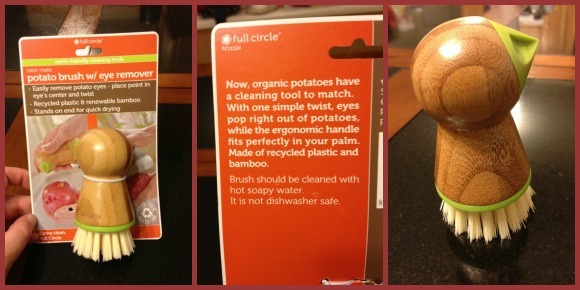 In a way, Full Circle makes the type of products the green community has been hoping to find for years! Okay, I won't lie – this is a gimmick that met a certain need for our household. As those of you who follow my blog know, we have a cute puppy named Reya. While we love Reya to death, she has it out for washcloths and hand towels. If it's in her reach, it will be annihilated. For this reason, we have towels hanging on the handles of our top kitchen cabinets. When I saw the Stick'Em Magnet Kitchen Towel, I knew these were made just for us! 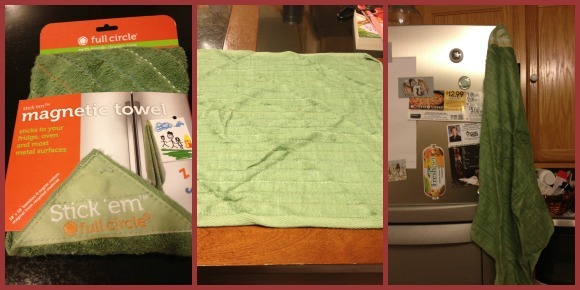 These towels have one corner that contains a magnet, allowing it to hang on the fridge or any other magnetic surface. Best of all, the material is made from bamboo and organic cotton, making it a durable eco-friendly cloth. Now, I have the ability to dry my hands or dishes without being worried about Reya grabbing my cloth first! Like many of you, I worry quite a bit about making sure all of my vegetables are clean. While some people may be fine with peeling potatoes, I refuse too since this is one of the most nutritious parts of a potato. The downside is that means I have to have a way (and the time) to clean the potatoes and get the eyes out. When I saw the Tater Mate Potato Brush with Eye Remover, I was excited since it means I had a way to speed up the cleaning process. I will admit though, the first time my husband used the Tater Mate Potato Brush, it was eye opening. I couldn't believe how much dirt he was getting off the potatoes! I actually felt quite guilty not having something like this sooner. While I was concerned about water damage to this bamboo brush, it was pre-coated with natural oils which so far have kept it doing just fine. I just can't believe I got along without this brush for so long! Out of all the products I got from Full Circle, this was the one I was the most excited about. While I am a big fan of Method cleaners, I have been made my own more than once to cut costs. It is so much cheaper, especially since you can buy the mega vinegar bottles at Sam's Club. 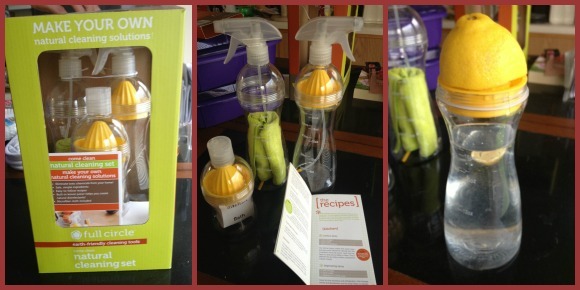 With the Come Clean Natural Cleaning Solution set, you get three bottles, two juicers, a microfiber cloth, and a book filled with recipes. The juicers have to be the spiffiest part of this set, since it allows you to add a citrus scent easily that isn't just a filler, since most citrus fruits are natural disinfectants. With the simple, no hassle instructions, you can easily clean your house using homemade recipes! So far, I love all of my products from Full Circle. They certainly seem to be quality products that are convenient, unique, and eco-friendly. Even my skeptical husband seems to like these products. For me, this is exciting since it mean I may have a new go-to brand when it comes to buying green cleaning supplies. I truly love that all of their products are made for eco-friendly people who demand quality. For this reason, I am happy to give the brand an A+ rating! Would you love to try some of these amazing products for yourself? Currently, you can purchase their eco-friendly, natural products on the Full Circle website, or at local retailers near you. To see where Full Circle products are sold in your area, their website has a user friendly store locator to make searching for your favorite products even easier. If you are like me, I am fairly certain you will fall in love with these high quality green products! Would you love the chance to try these products for yourself? We are happy to announce that we are working with Full Circle to give one lucky reader the chance to win the three amazing products featured in this review. To learn more, read the rules below and then enter through the Rafflecopter. Giveaway ends September 13th at 11:59pm. Budget Earth is not responsible for prize fulfillment or shipment. Disclosure: Budget Earth did not receive compensation for this giveaway, but did receive the products mentioned for review purposes. Facebook, Twitter, & Pinterest are in no way associated with this giveaway. Prize fulfillment and shipping will be handled by Full Circle. I like the hand towel with a magnet. Is it removable so you can launder the towel? I'll probably check out the site. Thanks. 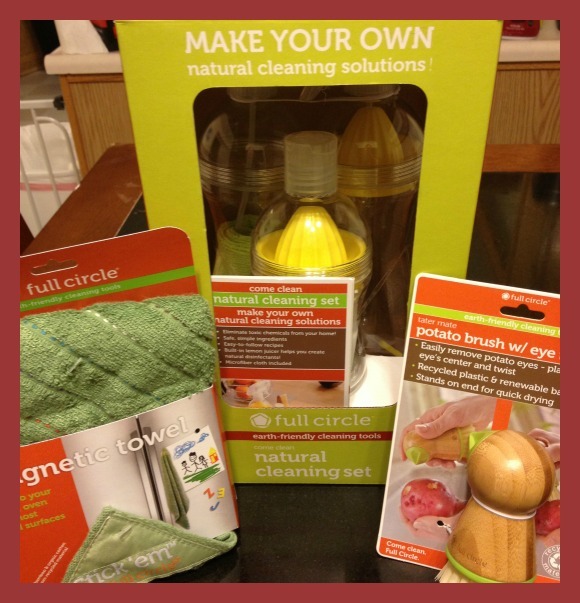 I love the Full Circle products you featured, especially the Full Circle: Come Clean Natural Cleaning Solution Full Set. How can you go wrong with homemade solutions & citrus scents? I'm always looking for "Greener" products. Thanks for the review! I use vinegar and hot water. I love how innovative and cute all the products are as well. I have to say though that my favorite is the potato scrubber. I never realized how much we needed one until I had it! This is awesome! I am like you, I am excited to try the solution maker set! It looks so beautiful, too, a lot better than those commercial spray bottles I've been using for my homemade solutions! Thank you for this review. Haha! I feel the same way! Where do you get your vinegar? I get mine in the giant containers at Sam’s Club since I use it for EVERYTHING! I love to eat potato skins, also, and always have problems keeping my scrub brush set aside just for veggies. With this brush, I don't any helper will confuse it with a plate scrubber! I also really like the magnet towel. Brilliant idea, sorry I didn't think of it first! We have minimal hanging spots available in the kitchen. Same here! I have a large kitchen, but its more because its meant to be a dining area too. My actual kitchen is so tiny. Until the little magnet towel, I”m sorry to say that we hung towels on our cabinet knobs! lol! The potato brush with eye remover is simple genius! Thank you for this great opportunity! I love finding new green cleaning products! these products look awesome. i swear i didnt knwo it was a giveaway until i tried to scroll down to comment. these look like fabulous products. and i can see even more uses for the magnetic towel, like beign able to stick it to a metal spice rack (for magnet spices) and how ingenious are those clenaign bottles.. all in one and ready to go. I love to try and make homemade cleaning products. I hate how expensive and full of chemicals cleaning products are. I have always wanted to make my own cleansers, especially now that I have a daughter. I would love the bottle and recipe book to do that!! I like the design of the products and colors are very neutral. I think Full Circle products are a great way to get rid of chemicals in the home. I love eco-friendly products! Although these are tools for being green, I’m also on the green cleaner bandwagon as I think we’re exposed to a ton of harmful chemicals, and it’s important to me to make sure that a home environment is as healthy as possible! It is good to buy green products to help the earth. These looks like good products to purchase. These sound like good products. I’m really funny about washing produce. As soon as I get it in the door, it goes in the sink. I wonder just how clean I’m actually getting it? I’ve never heard of Full Circle products but will look for them now! We need a dedicated vegetable brush.